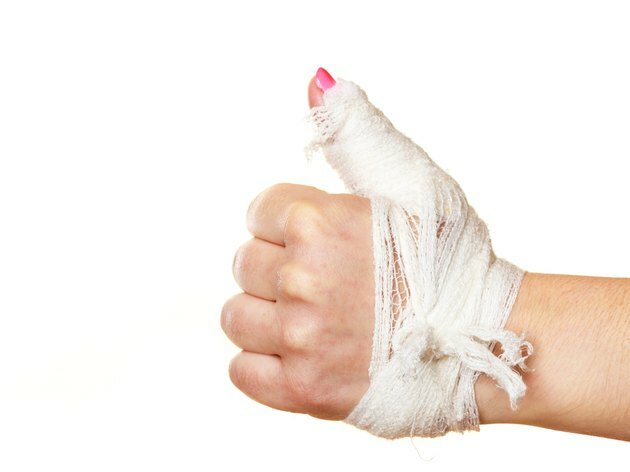 While a broken finger may sound like a minor injury, it can actually be quite serious. The bones in your fingers allow you to perform many everyday tasks and hold various objects, and breaking them can cause great discomfort. If you suspect you have broken your finger, visit a doctor immediately, as your finger may need to be put back in place, have a splint, or even be operated on. However, even in the most serious cases, a broken finger should not stop you from exercising, provided you stick to certain guidelines. Rule out squats, dead lifts and any exercises that involve gripping weights, but there is no reason why you can't do body-weight exercises. Try single-leg body-weight exercises like split squats, reverse lunges and single-leg dead lifts. According to corrective exercise specialist Mike Robertson, these help to build lower-body muscle and strength, and improve your balance and perception of neighboring parts of the body around your knee joint. You may find upper-body training quite difficult at first. As with lower-body training, avoid exercises that involve gripping anything; so omit row or pull-up variations, along with dumbbell and barbell exercises. You should be fine, however, to do some pressing exercises with chest-press or shoulder-press machines, as you can use these with open palms. If you want to train the back muscles, try exercises like rows, pull-downs and face pulls using just your uninjured hand. Unless you use kettle bells and weight circuit for cardiovascular training, your cardio routine should be relatively unaffected by your broken finger. Exercises on a bike, treadmill or stepper should be fine. Likewise, outdoor activities like walking and jogging won't cause you problems. If you'd prefer to spice up your cardio training, play a sport like soccer that doesn't involve much use of your arms. Once pain has subsided from your finger, perform some specific strengthening exercises on it. A set of hand grippers is ideal for this -- start with a light set, working up to closing the grippers for 20 repetitions. When you can do this, move on to a heavier set of grippers and try other hand-specific exercises like hanging pull-up holds -- where you hold your body weight from a pull-up bar for as long as possible -- or do some of your dumbbell and barbell exercises using some thick grips.